This time last year I was going through a rather rough time. I had just left hospital after a week’s admission to treat a bowel infection following my bowel resection in May. Antibiotics, fluids, nutritional supplements and lots of rest later, I came home. Unfortunately, it would not be my last visit to the hospital that summer. What I did start to develop at the end of this particular admission were red lumps on the back of my forearms. They looked like bites, they were incredibly itchy, as well as being really swollen and sore. Throughout the rest of the summer these lumps would almost fade but more would then follow; and these would become more and more painful, eventually spreading to other extremities. These are called Erythema Nodosum. I have had these before, prior to 2016. Upon my diagnosis in 2011, I had what many doctors thought was cellulitis. In fact, I had Erythema Nodosum (EN), a systemic symptom of Inflammatory Bowel Disease (IBD). Skin complications or symptoms such as this are small percentages and affect more women than men. Not many GI’s or indeed anyone in digestive health see these, so I was subjected to lots of people coming to look and take photos. At the time, all I wanted was to be left alone. But now, with hindsight, I know that making more healthcare professionals aware of these is important. Well, it means that my IBD is massively uncontrollable when my EN flares up. As my summer of 2016 continued to become more and more hellish, the EN would become deeper, larger, more painful but I foolishly forgot to mention them. As it is uncommon to present with EN, I just thought it was ‘one of those things’ and I should just get on with it, hoping they’d go away but if I had spoken up, something would have been done. In the scheme of things, I had more pressing issues at the time, my sore arms and legs were way down the list of priorities. Once they discovered my colon was eating away at itself and it needed removing – creating my ileostomy – they looked at me. PROPERLY LOOKED AT ME, and the EN were glaringly obviously. And I noticed them more then too. The progress of my EN between June – August 2016 can be seen here. Who develops EN and how does it affect IBD? EN is a type of panniculitis – the inflammation of subcutaneous tissue. It usually occurs in the layers of fat underneath the skin. Commonly associated with the shins but it can affect other extremities. They are tender nodules which come and go with flare ups in inflammatory conditions. 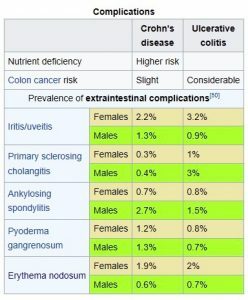 In IBD it occurs mostly in Ulcerative Colitis (2-4%) although it can affect those with Crohn’s Disease of the colon (1-2%). Women are more commonly affected than men and appears in conjunction with a flare up of IBD, or the onset of a coming flare up. It usually improved when the bowel disease is brought under control with anti-inflammatory medications. As it is not a common symptom or presentation of a IBD flare up, it can be often overlooked. And most doctors will think its cellulitis as it looks very similar. What goes along side it is the usual symptoms of IBD – significant and dramatic weight loss / gain, diarrhoea, vomiting, lack of appetite, changes in bowel habits, passing of bloody stools and fatigue – which should be recognisable as IBD. EN can be an early warning system of an oncoming flare up – if you are already diagnosed – or indeed of a deeper problem within your disease pattern. Either way, please do not overlook it. My specialist and I both know that when my EN returns, I am in bad shape. Within a month of my ostomy surgery in August 2016, my EN had cleared up and has not left scarring. The combination of controlling my disease, steroids and regaining my strength was key to fighting them off. Disclaimer: This information is based on my own personal experience of my IBD symptoms and complications. This is not meant to scare but to educate those who might be struggling with an overlooked extra intestinal manifestation of their IBD. If you seek advice regarding the symptoms related to your condition or indeed any discussion about your treatment of your IBD, please contact your IBD team for medical advice. Thanks Louise very enlightening. Not heard about E.N before. Sounded like a Harry Potter potion before I read your post. Do you think conditions would be easier to understand if given more understandable names? Might help with diagnosis too? My Latin G.C.S.E was of no use here…. Thank you Peter! They do sound abit magical on the front of it, but are shockingly painful. I spent a lot of this time last year having them ruin my surgical recovery. I think they would be, some conditions vary so much in their symptoms, let alone how they are pronounced and explained to patients. It is on the IBD symptoms but it is so rare, I was a special case; as I seem to be in many aspects of my disease.